We had an opportunity to interview Nick Bruty, creator of the original MDK, now Co-Founder at Rogue Rocket Games. What was the primary inspiration for MDK and why did you feel that the world needed a game about the Earth being mined in a otherworldly caused apocalypse for industrial reasons in the early 90's? Nick: I’ve always been a fantasy and sci-fi fan but I had just made a series of cartoon style games from Aladdin to Earthworm Jim. I was having fun on those titles but feeling the itch to go back to my sci-fi roots. It was in the middle of crunching on Jim that I took a break and just started doodling. Before I knew it I had drawn this futuristic spy character hanging off the side of a building with a gun attached to his face. The earth mining was really about Aliens doing business dealings just as we do on Earth. There was no great Alien takeover, just good old backing stabbing business. Most heroes are knights in shining armour, Kurt Hectic is a janitor in a tight fitting black leather suit with a complicated gun on his head which part of it detaches to his arm, is there any reason behind the specific design and name of the character as we see him in the game? Nick: When I pictured Kurt getting into position for his shot he was always hanging off the side of a building. I thought, well he needs his hands free to hold onto things so why not stick the gun on his head. It just seemed to make sense at the time. For the styling detail I wanted something that would add character rather than just tech looking stuff. I looked at some old armor, I think it was Spanish, and liked the ornate flourishes. Small enough that it didn’t affect the form of the suit but added a nice touch. I always struggle with names. There was a line from the movie Naked with David Thewlis who asks a rather bizarre character what it’s like in his head, hectic? For some reason that line stuck. It seemed like an interesting name for someone whose life is about to get very hectic indeed. My favorite name is Dr Fluke Hawkings though. The Coil Suit is a huge piece of the symbolism of MDK and instantly recognisable even in silhouette form, much like Batman's own suit and cowl. It's practically impossible to imagine Kurt as a hero without it, how did the design and concept of the iconic coil suit come to be? Nick: I like all the tech design I do to be rooted in some kind of logic. I was just trying to come up with a suit that would stop bullets or force. The idea is the energy of the bullet itself would cause the suit to recoil, condense and become stronger at that point. It would be fun to actually build this stuff one day! We swear we've seen pictures of concept art of a bike on an old archived Shiny hosted MDK site...did Kurt once have a similarly themed bike to the coil suit and would you liked to of had more vehicles in the game? Nick: Yes I designed a bike with roller balls for wheels. I started to model it but we didn’t have time to get vehicles in. However I didn’t plan on having vehicles as a heavy component of game play as I wanted the design of the levels to focus on Kurts abilities. The character we come to know as 'Max' in the MDK franchise is originally named 'Bones' in most of the game MDK(1). BUT, is briefly mentioned being named 'Max' by Kurt in Doctor Hawkins' diary inside of the instruction book. Was there a name change during the development of the game and do you sometimes wish that you'd called him Max throughout the whole game, if just to make the meaning of 'MDK' more open and marketable as Bioware attempted with the emphasis on Max, Doctor and Kurt in MDK2? Nick: He was originally called Bones. The change to Max was to fit the title as you suggest but I never liked it. He’ll always be Bones to me. Minecrawlers seem to have a familiar function to the Streamriders like a standard lawnmower used in our common back garden, was that intended in the design in order to scare the players how insignificant we are in a 'Hitchhiker's Guide to The Galaxy' fashion, plus, did they actually contain cities as quoted? Nick: The Streamriders really didn’t care much what we thought of them. While they mined the earth they moved over they were really preparing it to be peeled like a orange. The Minecrawlers were only stage 1. Yes we wanted to have far more cityscape scenery to the levels but it was too much off a performance issue back then. Most 3D games were still running in a very low 320x200 resolution back then. With the Sniper mode I wanted to have more precision so we opted for 640x480. Laughable these days but it was all in software back then. Each minecrawler's interior is different, much like a different world. Was there any reason in the narrative to have different themes in each level, such as perhaps themed around the commander of the minecrawler or was that just for variety for level and art design? Nick: The Streamriders weren’t a single alien race. It was more like a coalition of mercenary business partners. Each partner brought their own minecrawler. I wanted there to be plenty of visual variation. Especially with the glut of grey corridor FPS’s at the time. Where did the idea of the Interstellar Streams come from? Nick: I wanted a unique way for them to travel that you could see visually. They are like straight worms holes. Actually, speaking of which, where did the Streamriders come from in the fiction of the game? Are you for MDK2’s canon with ‘Swizzle Firma’, was there another origin or would you rather not say? Nick: I had no conversation with Bioware when they took over the franchise and they went in there own direction for the story and characters. They are cool guys and I’m glad people had fun with their version. In my world the Streamriders are not from any one place. They are a mix of Alien races from all over bound together by backstabbing greed. We'd love to hear the name of the classes of enemies in the game, we've never found out. Surely each type of enemy had a real name in pre-production; it'd be great if you could give the names to Hectic HQ for each main type of enemy from the game. Nick: I’m afraid we didn’t go deep into each class of enemy. There simply wasn’t anytime to develop the world out further than the immediate needs of the game. I had always planned to go back and develop this further with sequels but I wanted to take a break away from the project. Interplay wanted to go straight into a sequel and the game was given to Bioware. Killing and hiding in the 'alert bot' in the first level of MDK was pretty funny especially once we got our hands of The World’s Most Interesting Bomb, was there once going to be more opportunity of stealth in MDK early in development? Nick: Yes there was much more “fun” stealth planned. Unfortunately we lost a lot of design time just getting our first 3D engine up and running. It’s very challenging trying to build a game while waiting for tech to come online. It’s all quite easy now but at the time everything we built was from scratch and we didn’t know what was going to work. With all the modern technology and game mechanics in games now, what would you change in MDK if you had the chance? Would you add additional stealth (as asked above), vehicle sections like Halo or even duck and cover shooting mechanics ala Gears of War and Uncharted? Nick: I don’t want to go too far into this as I may develop the ideas for a future title. I will say Kurt was meant to be far more agile and be able to scale buildings, kind of like spiderman. The design of the helmet was to allow his hands to be free to attach to any surface. Looking back at the game. There's no difference between saving the city/town or allowing it to be churned and processed into pure carbon not completing the level in time. Was there any point in the games development that there would be any morality or punishment for not saving the location the minecrawler was in the direct path of and would you change that now seeing how gamers like to be challenged? Nick: I wouldn’t say there was morality choice but we did want to have a little more wicked fun with it. Again the short development cycle forced us to make cuts to the scope of the game. This is a question that's gotten all of us at Hectic HQ scratching our heads, is there any reason why the fourth world of MDK doesn't have a proper boss and disintegrates as normal? Nick: Just deadline constraints. The whole game was made in just over 1 year with 6 people while building our first 3D engine. It was kinda crazy inretrospect but I’m happy with what we achieved. We had to make many cuts to the original vision. There were going to be 8 worlds not 6. Gunter Glut in the last level is a rather easy boss compared to the prior challenges at the end of each world (except the above mentioned World 4) Is there any reason for making Gunter easy or was it just general irony in the method how he gets beaten? Nick: It was very tough for us to gauge difficulty as we had no focus groups to speak of back then. If fact I’m sure a lot of features wouldn’t have made it through if we did. A lot of our challenges were rather bizzare in nature leaving some people scratching their heads so I’m glad that players were able to get though. We've heard rumour of MDK originally being planned to have 7-8 levels in total, is there any truth to this and what theme in the ‘missing levels’ could we expect? Nick: Yes, there were 8 levels planned. One was to be a very old minecrawler, very mechanical and clunky with things falling off. The other was going to be a bit swampy with strange organic things growing in places it shouldn’t. Hypothetically, if Interplay contacted Planet Moon as a third party to develop MDK3, or a reboot of MDK through you, what would your reaction be? Nick: I approached them a while ago to try and license the IP back but unfortunately we couldn’t work out a deal. I had an outline that carried on from the 1st game with a whole new range of mechanics to fulfill the original vision that I was very excited about. I will be making an announcement in the following few weeks to explain our new plans here at Rogue Rocket Games..
MDK apparently had licensing deals set for animated TV series and action figures, much like Shiny's previous success Earthworm Jim. We've also heard whispers of movie screenplays which were unfortunately never green lighted. Would you care to speak about what us fans would see if we walked into a parallel universe due to a freak 'flange orbit' where these licensing deals actually happened? Nick: We had talks but nothing concrete. The company that was interested in the TV show wanted it to skew for a much younger audience which would have changed the whole tone. In fact I’m not really sure how they could have even done that. Post the launch of the game we did write a screenplay but at the time we were also leaving Shiny to form Planet Moon which threw a spanner in the works. 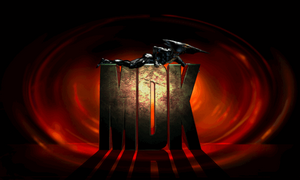 Was there any early pre-production for an MDK2 under Shiny until Interplay gave the IP to Bioware? Nick: No. I had done back to back games with Earthworm Jim 1 & 2 and felt there wasn’t enough of a break between the 2. The sequel didn’t feel as fresh as I wanted. I didn’t want that to happen to MDK so I focused on Giants and planned to come back to MDK afterwards. But Interplay wanted to move forward straight away so I had to let it go. If you could please give us a new meaning of MDK that you haven't given to the press or publicly in the past as an exclusive to Hectic HQ. You have to open a large metal door or a force field, Worlds Most Smallest Nuclear Bomb or snipe a set of plasma ball door locks? Nick: Oh easy. World Smallest Nuke. They’re so tiny and cute. What gadget from MDK would you love to be real? We're pretty sure it wouldn't be the Health Box with legs, because that would make meals very awkward. Nick: Not quite a gadget but I’d like to have Bones. He’s such a loyal chap and would never let you down. On a good day, 2.5 million people will die. What would happen on a bad day? Nick: Everyone else, leaving cats to rule. Can you give us some juicy info we didn’t know about MDK and haven’t asked about no matter how technical or complicated? Nick: The pitch to our Publisher, Playmates, went terribly. I think they were expecting an EWJ type of game. I was using storyboards and trying to explain to a middle aged business man what Grunts and Streamriders were. No one had a clue what I was talking about and in the middle of my presentation the OJ Simpson verdict was about to be announced and everyone left the room effectively ending the pitch. Thankfully that did the job. Although it was a close call as a hard drive failed and we lost the last minute of footage. We had to go with a lower res test render which is why the quality drops towards the end. No seemed to notice though. Nick: I’m afraid not. We were contacted by the band after they saw the game at a European trade show. They asked if they could use our visuals for a video. We thought this was rather strange and wonderful and said, sure but how about you let us use the video in the game itself. Our animator overlayed some of the games characters on the video and apparently that upset someone over there. I never met anyone from the band or ever heard from them again. Just a couple of ships that passed by in the night. Thanks Nick! We wish you all the best for your future! Wow! i couldn't possibly thank you enough for this :-) i always wanted to know what they were thinking when creating MDK. Good to hear that. I'm glad you like it.